I have wait lists for upcoming litters and for future planned breeding. You may get on a wait list by emailing me. Please be sure to tell me what you are looking for. Ex. male or female, long or smooth, piebald, dapple, solid, and color. 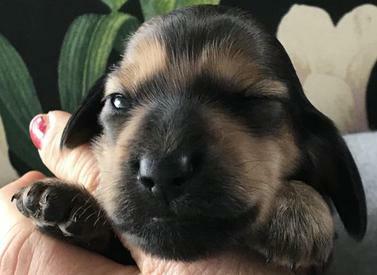 Wait lists go in order, if there are multiple waits for the same puppy, say there are 2 people waiting on Grace to have a Choc/tan Female, First person gets first pick, then second pick and so on. Wait lists are not obligated to buy. Wait listers must put a deposit on their picked puppy by 1 week old or lose their pick. I do not hold puppies without a deposit. Feel free to contact me if you don't see what your looking for and I can refer you to another breeder that may have what your looking for. I'm unable to tell if a puppy is short haired or long haired until 3 weeks and most of our smooths carry long so most of our litters have both. I enjoy talking about my dogs so please if you have any questions please give me a call or send me an email. Prices listed is for AKC limited registration. For full AKC (breeding and show rights) please call. No, we cannot provide cash refunds for sold puppies or dogs. All deposits and monies paid for a reserved puppy are non-refundable, and nontransferable. Unless something happens to puppy during my care. age can be visited. We can however provide photos.